ZenithOptimedia has unveiled 10 trends that show how technology will enable consumers to become increasingly mobile in their behaviour, presenting new engagement opportunities for brands. Building on ZenithOptimedia’s recent research report with GlobalWebIndex – The Mobile Imperative – which found that young people around the world will spend more time accessing the internet via mobile than via all devices combined by 2018, our 2016 Trends reveal some of the ways in which people will shift to a truly mobile lifestyle. The report highlights the need for brands to adopt a truly ‘mobile first’ approach to marketing, as mobile moves from becoming just another medium in the mix, to the underlying platform for brand communication. 1.Progress with speech recognition technology – making it easier and more reliable – is set to drive voice search in 2016. Brands will need to reassess their search strategies to take advantage of the different way in which people vocalise their searches. 2. With the rise of adblocking native advertising will become an increasingly important way to engage consumers. Brands will need to assess the changes they need to make to the creative process in order to make native a key part of their marketing strategy. 3. Emoji are increasingly becoming part of the language of the mobile consumer. They can transcend cultural and language boundaries and present brands with a new and authentic way to engage Millennials. 4. Instant messaging apps are set to become the platform of choice as young consumers want more personal relationships with selected groups of friends and family. For brands, instant messaging is an opportunity for delivering experiences that are more personalised and interactive. 5. In a world of automated recommendation services, consumers are seeking personalisation with a human touch. Concierge-like services are expected to spread beyond fashion and high-end retail to new categories in 2016, democratising the personal shopping experience. 6. 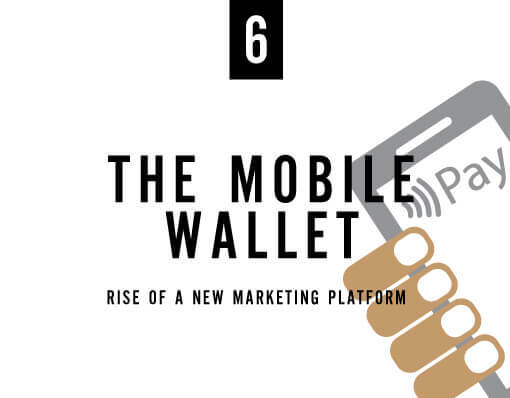 The Mobile Wallet will emerge as a new marketing platform in 2016. Over the past year or so a host of ‘mobile wallets’ have launched – such as Apple Pay and Android Pay – and these are set to evolve into an effective marketing platform offering both services and brand content. 7. 3D printing will revolutionise consumer journeys over the next two years by becoming a faster and more cost-effective method to produce customisable products. For brands, the opportunity is to deliver these faster and cheaper, whilst providing a truly customisable brand experience. 8. More brands are making use of temporary physical spaces where consumers don’t just shop, but have shopping experiences. These spaces will increasingly allow consumers to have physical interactions with brands they have discovered or interacted with via the mobile web. 9. Online shoppers are now demanding faster and more convenient delivery. New technology and the rise of the sharing economy will allow brands to dispatch deliveries swiftly while fitting in with consumers’ busy schedules. 10. Virtual and augmented reality will become a mainstream consumer experience. As more smartphones are being designed with virtual reality in mind, mobile devices will become the main driver of VR experiences.